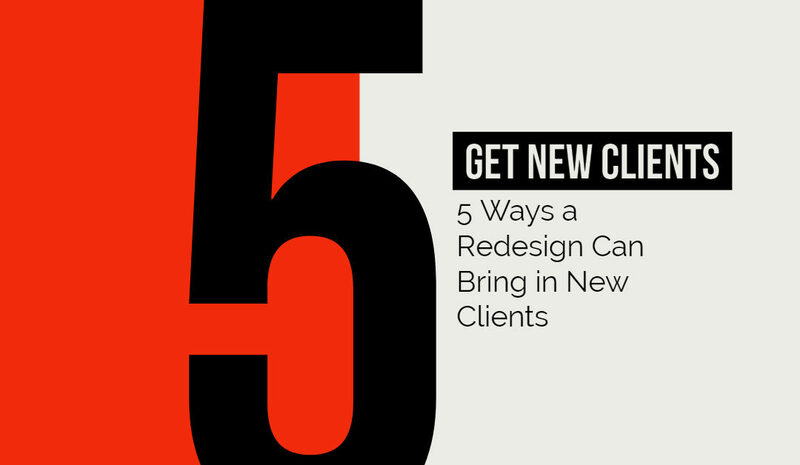 When was the last time your website was redesigned? If the answer is 2015 or earlier, it’s overdue! More than 80 percent of potential clients in the market for professional services, including law firms, visit websites before making their decisions, and more than 60 percent of people who are interested in your firm’s services will Google your firm’s name to find out more about you and your business. A website redesign that’s fully compliant with Google’s best practices, which change from year to year, can give your law firm a jump start into 2019 and a leg up on your competition. 1. It gives you a chance to refocus on your goals and your strategies. Your business has grown, changed, and evolved over the years. But if your website is several years old, it’s still presenting an outdated and potentially irrelevant image to potential clients. It’s important that your current services, branding, and content match both the way your business runs and what’s effective on the web in today’s highly competitive digital landscape. • Mobile responsiveness – Websites that automatically resize and reconfigure themselves when viewed on mobile devices are easy to navigate and are rewarded in Google’s search rankings—not to mention easier to use for potential clients. • Clear navigation – Users who can quickly and easily navigate through your website to find relevant information will be more likely to complete online forms or call. • Latest features and enhancements – Everything from plugins and advanced programming to search engine optimization and analytics are important tools for business owners, and they’re our bread and butter. • Fast loading – In an age of broadband and 5G internet, no one wants to wait on a website to load. We build sites that are lightweight, sleek, and lightning fast to load without sacrificing visual appeal or eye-catching design. 3. New content helps your website perform better with users and Google. Content ages just as quickly and poorly as outdated design. Today’s web users demand content that’s relevant, easily readable, and highly informative. With a website redesign, you get a chance to reconfigure your site content to match your firm’s true image, tone, and personality, while also knowing that it’s written in a way that will boost your credibility and search rankings. 4. Design techniques help you stand out in a crowded market. When potential clients are searching for attorneys, they often make snap judgments about law firms—especially when comparing their websites. And if your website is old, their first impressions won’t be good. Because we constantly research and test new design trends, we know how to create websites that are both technically and artistically cutting edge, both of which help give you a major advantage over your competitors. • Improving your organic search ranking – Creating a website that checks all of Google’s boxes in terms of what it wants to see—user friendliness, fast loading times, fresh and informative content—can help push it higher in organic search results. Organic search results are still the biggest factor in driving traffic to websites, especially for websites in the first three ranking positions. • Improving your local search visibility – It’s not just enough to rank well for a given keyword or phrase anymore. You also need to rank highly for your city, community, and even neighborhood. Because so many people search for local businesses using their smartphones, Google literally puts companies “on the map” if they rank well locally. That means those businesses show up on the maps listings that appear on almost every search. And if your business shows up on the map, it will be easier for potential clients to read reviews, check out your website, and most importantly—contact you. • Developing an effective Attorney Google AdWords Strategy – It’s clear that Google is pushing for more and more businesses to utilize Pay-Per-Click (PPC) campaigns via its AdWords program to reach potential clients. After all, the first four results for most searches are paid ads, and they look nearly identical to organic results. Our marketing team believes in the power of PPC campaigns, but we also know that they’re most effective when they’re backed by research, data, and the full implementation of the Google AdWords interface—not its automated AdWords Express alternative. Check out our blog about the Benefits of Law Firms using our Google AdWords Management Service. Getting optimal ranking, map, and ad results on Google—which remains the best search engine for your firm’s website to be found by potential clients—requires a diversified approach. At Brad Hart Creative Group, we know how to maximize the effectiveness of all three aspects of a strong and results-driven web marketing strategy. Your website is simply too important to ignore or leave on the back-burner. The statistics don’t lie, and they’re leaning more and more in favor of law firms that take proactive approaches towards their online presence every day. Our development, design, and marketing team can work together to redesign your website to be optimized for modern browsers and devices, easily navigated by the people you want to reach the most, and quickly found via the most popular search engines. But it’s important to remember that one size doesn’t fit all when it comes to modern websites and marketing strategies. We know law firms, and we know what makes one legal website successful and another ineffective at generating leads and converting potential clients. It’s a new year and a new opportunity for you to take advantage of everything the internet has to offer. Brad Hart Creative Group offers proven data-backed strategies for taking law firms like yours to the next level via highly professional websites, and we’re ready to get started for you today. Contact Us Now to talk about your web design.